A day in the life with Spencer the American Pit Bull Terrier puppy. Spencer's 36th week—45 weeks old, 80 pounds, 22 1/2 inches from the ground to the highest point of the shoulders (the withers). 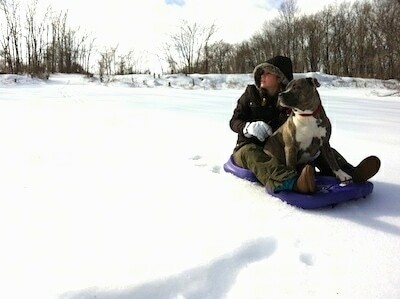 Spencer likes to go sledding! The plan was not to teach the pup to sled but it just worked out that the kids did everything right when introducing him to the sled. Amie had sat down on the sled to avoid getting her pants wet and cold. She noticed that the pup didn't seem to want to sit in the snow either so she called him over and told him he could sit with her. They sat there for a while as Amie talked with friends. Then they decided to move a little to a different location so they moved the sled slowly while the pup was still sitting on it and gradually started to move faster. The first time they actually sledded down the hill they took a spill and Amie laughed at the sheer thrill of the ride. 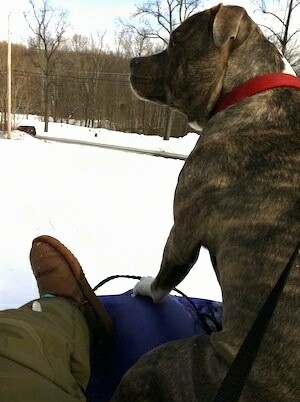 The pup had jumped off and happily licked her face and got back on the sled with her. The second time they went down it was long and fast. They spotted two little dogs down the road walking their humans. The dogs were barking and growling at Spencer. 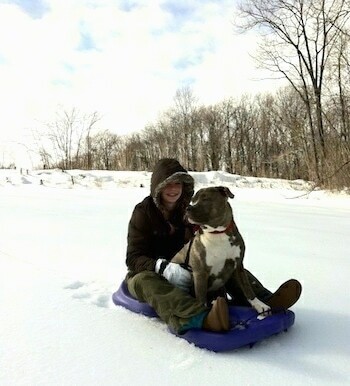 The owners of the dogs stopped to watch him sled while their dogs barked and growled away. Spencer looked at the dogs but he just kept on sledding. He didn't even try and run after the dogs. Spencer had a great time sledding down the hill. The kids took one video clip of him sledding. They say this was one of the slower runs; they went faster on some of the other hills. Spencer goes on a camping trip with a bunch of kids. 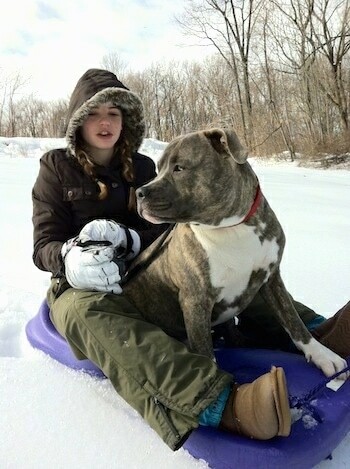 When it's time to go sledding he has a great time but has to be told not to run after and lick the sledders’ faces. Amie works on telling him not to do it. “Spencer, it is total bad manners to be in the kids’ faces like that.” After a bit he gets a lot better. Spencer sleds down the hill with the kids and wipes out a few times, yet he still has a blast. The kids call him up and down the steep hill and he runs up and down to see them. This pup loves kids! After Spencer's day of sledding he is exhausted! The entire weekend wore him out. Time for some puppy sleeps. I am happy to report that we visited those "scary" see-through stairs again and the pup went right up them like he had been doing so all his life. Speaking dog can be really amusing. Spencer had walked over to me and was just standing there looking. I decided to have some fun. 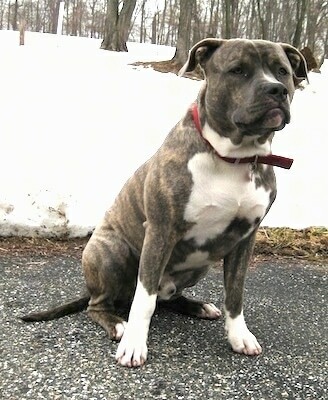 I looked at him then did a play-bow and started moving my body like I had a short tail and was wagging it. My body was wiggling like a dog’s does when he plays. Spencer suddenly play-bowed back and ran for a toy. I had just said to him, "Hey Spence, do you want to play?" I tossed his toy to him a few times and he loved it. At 4:00 a.m. I heard Spencer whine. I went downstairs and he was sitting at the door staring at it. He had to go outside. I opened the door and he went right out and did his business and came back to the porch. I let him in and he went right to his bed and back to sleep. I feel pretty confident about leaving him out of the crate as long as someone is here to let him out when he has to go. Good boy, Spence! 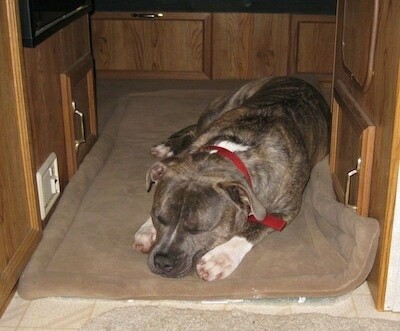 My first experience with a dog and a laser light was with Spike the Bulldog. 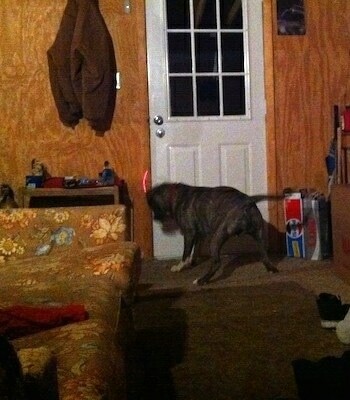 When we would turn on the light he would chase it like crazy. Spike the Bulldog and the Laser Light. At the time it seemed harmless and it may have been. However Spike had a cork tail that always seemed to be in the same position and I was not as knowledgeable about natural dog behavior back then as I am today. Recently on a camping trip Spencer was introduced to a laser light by an eight-year-old little boy and I watched his normally calm self who carries his tail down low go into pray mode and his tail went up. Not all the way up but up higher than normal. The light tapped into his hunting instincts and he was out to get that light. I was watching the little boy play with the light and Spencer. I have not totally decided if it was an all-out bad thing or not, but I have decided that if a dog is already not a balanced, submissive type dog that is comfortable with its place in the pack, that light could have put that particular dog over the edge. My advice is to be careful when getting out a laser light with a dog.